As Ned Stark used to say (when he still had head on his shoulders) “the winter is coming”. Shorter days and colder weather is a perfect time to cook all kind of casseroles and stews. Hearty, warming and full of flavour, these kind of dishes are just ideal for the long, cold evenings. Several months ago I published a post about beef steaks. As prime cuts steaks often take the limelight. Whilst I love steaks, I am also a big advocate of using all available cuts of meat from the animal. More humble cuts, when cooked well, can deliver fantastic flavours as well as being less expensive. 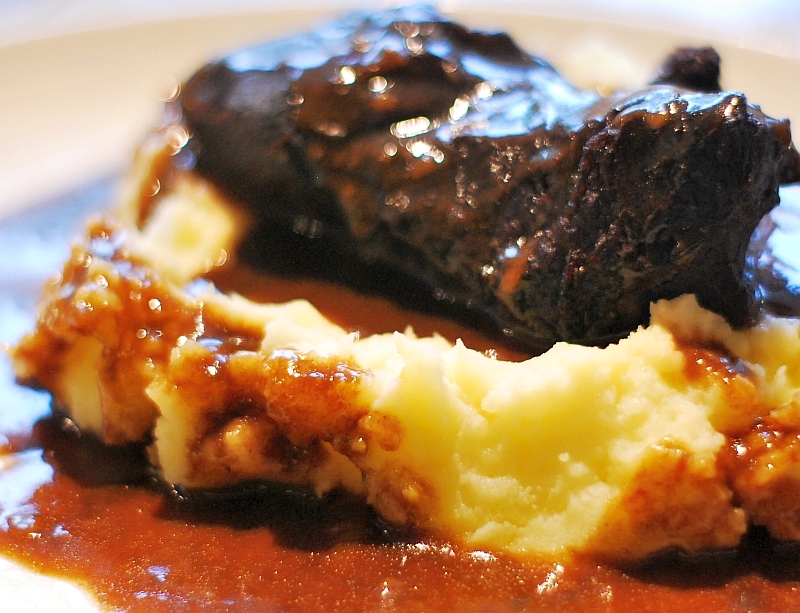 Ox (or beef) cheek is a perfect example. When used in slow cooked dishes it develops a superb fall-apart texture. This is due to the gentle fat marbling in this muscle that bastes the meat when it cooks. It may look like this recipe requires quite a bit of time to prepare. But believe me it is not labour intensive at all and the result is definitely worth a wait. You can replace the ox cheek with other typical braising cuts such as oxtail or shin or use even pork or veal cheeks. My personal favourite however has to be the ox cheek. Place the cheeks in a large plastic container with a lid and pour in the wine. Close the lod and place in the fridge for 12 – 24 hours. When you are ready to cook, lift the meat from the marinade and dry it with the paper towel. Set aside, and reserve the marinade. Heat half the oil in the casserole dish over medium heat. Add the shallot, carrot, celery and garlic. Increase the heat to high and fry the vegetables stirring frequently. When all the vegetables are covered in oil and the shallot is starting to brown, remove them out of the dish and set aside. Add the remaining oil to the casserole dish. Season the cheeks with salt and place them in the dish. Turn them over few times to ensure they are browned thoroughly. Return the vegetables to the dish and add the peppercorns, juniper berries and rosemary. Mix with a wooden spoon, then add the marinade. Keep it on high heat for 2 – 3 minutes to deglaze the dish and evaporate the alcohol. Now add the stock, ensuring it is level with meat but not above it. Bring to boil, then reduce the heat, cover and simmer for 30 minutes. Meanwhile pre heat the oven to 160 centigrade. Transfer the casserole dish to the oven for about 2.5 hours. Turn the meat every 30 minutes or so to ensure it remains moist. If the liquid reduces too much add more stock or water. 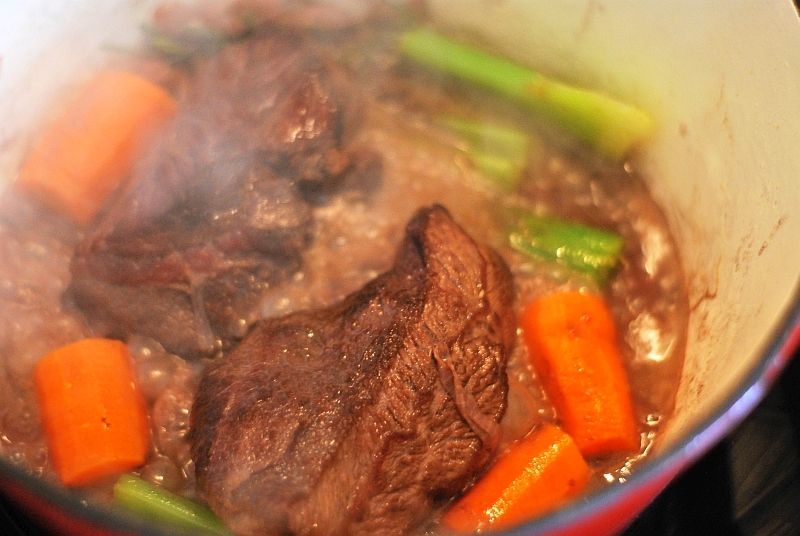 By the end of the cooking time, the liquid should have reduced by about half. While the meat is in the oven prepare Buerre Manié by mixing the flour and butter together in a small ramekin until thoroughly combined. Make sure that the butter is softened but not melted or oily. When the meat is cooked (it should be tender enough to cut with a fork), remove it from the casserole dish and set aside. Strain the liquid through a sieve into a saucepan. Discard the vegetables and return the meat into the casserole dish. Set aside to keep warm whilst you prepare the gravy. Bring the cooking liquid to boil over high heat. Take couple of tablespoons of the liquid and add to the butter and flour mixture. Mix well until you get a thick paste. Add it back to the boiling liquid and whisk well. Cook over medium heat stirring frequently until the gravy thickens to the desired consistency. 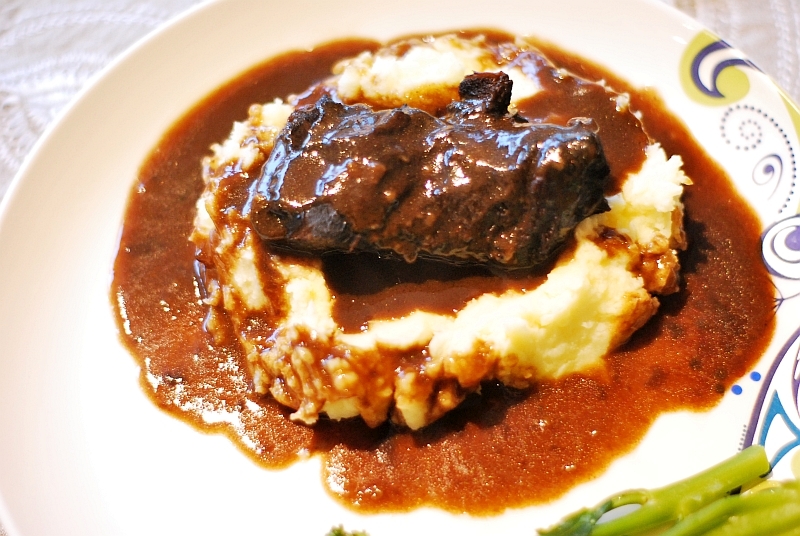 Serve the ox cheeks and gravy with steamed or mashed potatoes and a glass of Montepulciano D’Abruzzo.